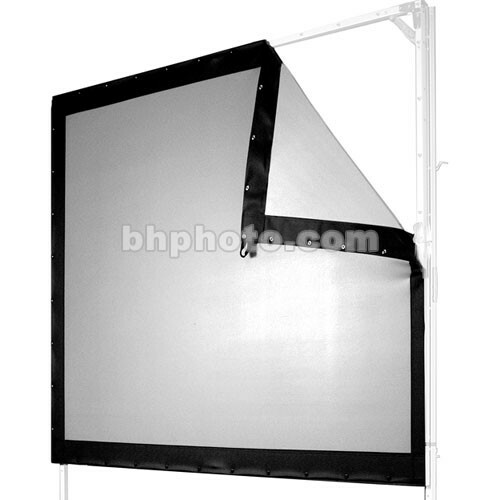 68 x 114" 8'2" x 13'11"
The Screen Works EZF681142V 60 x 106" E-Z Fold Single-Tube Portable Front or Rear Projection Screen is a lightweight, free-standing, portable projection screen that can be set up and taken down easily with its no tools assembly. The screen comes as a kit with a frame, surface material, a pair of single-tube T-legs, hardware (crankbolts) in a zipper pouch, and a case. A versatile surface material, 2-VU provides front or rear projection capability and eliminates the need for changing surfaces to accommodate varying projection methods. Under controlled lighting conditions, the material provides crisp images. It offers a gain of 0.6 and a 100° viewing angle. The surface is foldable and washable. The frame is height-adjustable in increments of 6" and the rugged aluminum T-shaped legs support the screen surface for virtually all applications. The screen is suitable for rental and staging applications such as point-of purchase displays, lectures, classrooms, libraries and can be setup and used by professionals or beginners. Viewing Area 60 x 106"
Box Dimensions (LxWxH) 42.0 x 10.25 x 9.5"